This week, the Runner's Lounge turned the tables on us bloggers. We needed to both ask a question and provide the answer. Q: I've just started running and my knees (back, hips, etc.) hurt. What do you think it is? Q: I've been running for a while, but I just started to have problems with my knees (back, hips, etc.). What could it be? A: More than likely, it's your sneakers. While the pain may be an indication of other, more serious things, make the life of your sneakers the first thing you check. When most people just start out running, either at the gym on a treadmill or outside, they use sneakers that they've had for quite a while. In many cases, they're a couple of years old and they've worn them while running errands, etc. Change your shoes. You wouldn't drive your car with tires that are bald or wearing unevenly. That's just what you're doing when you wear sneakers that have outworn their life. I know the day that I need new sneakers. While I'm running or afterward, my lower back starts to hurt. Without fail, it's my sneakers. I go out that day and pick up a new pair, and voila, back no longer hurts. I can use my sneakers for no more than 400 miles. That's probably at the lower end, as I know some people can wear them as long as 500 or 600 miles. 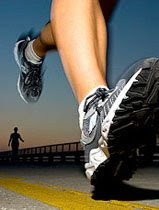 A sneaker's life varies based on weight, running style and shoe quality. Try to keep up on how many miles you've put on the sneakers. And only use those sneakers for running. Great question AND answer. This is a lesson I had to learn the hard way, but now I seem to have it figured out. For me, I replace my shoes around 250 miles. I keep a couple pairs around too so one can rest for a week while one of the others are working. That might seem low, but it works for me. And I send my old shoes to my sister who loves walking around in them and wears them out! Nice post.. I've come to appreciate shoes a lot more myself, and change them out a lot more often. For me, my knee will bug me. And it looks like my sneaks only last 350 miles... Go figure! Nice post. I have the exact lower back issue that you mentioned. As a result I am big fan of J's philosophy, although I don't discard the shoes after 250 miles. At about half of their usable life (say, 200-250 miles for me)I'll buy a new pair and let the old ones become my rainy day pair. It's debatable if this is actually beneficial, but I know I always have one pair of shoes in my closet that's in great shape. Hmm, the first thing I thought of when seeing that particular photo was the heel-toe running. But you're right, inadequate shoes is probably the first thing to check.